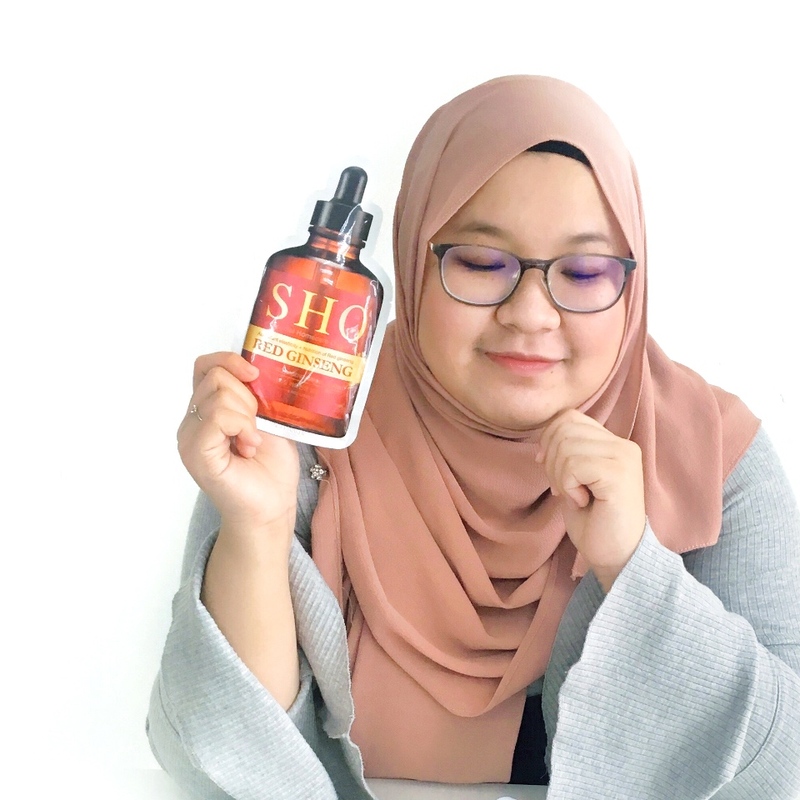 Lately, I found myself down the rabbit hole trying to find more anti-ageing products for my skin. I realised that 2018 is ending and just a few of years after that, I'll be reaching the long-dreaded number 30! So I panicked. Like really, I started noticing more fine lines, obsessing over them and started to remind myself to not scrunch my face too much while thinking. Like really how hard do I think on a daily basis that I have obvious lines on my forehead? I am starting to understand why those crazy rich older ladies in dramas or movies got so addicted to botox lol (laughing but crying on the inside). You might want to say; 'Anis, what are you saying, your skin in your pictures look fine! ', and to that, I'd say, 'don't believe anything you see on the internet' HAHAHA. Often times, I had my friend Meitu's magic aiding me. In K-beauty, one of the star ingredient when it comes to anti-ageing is red ginseng. 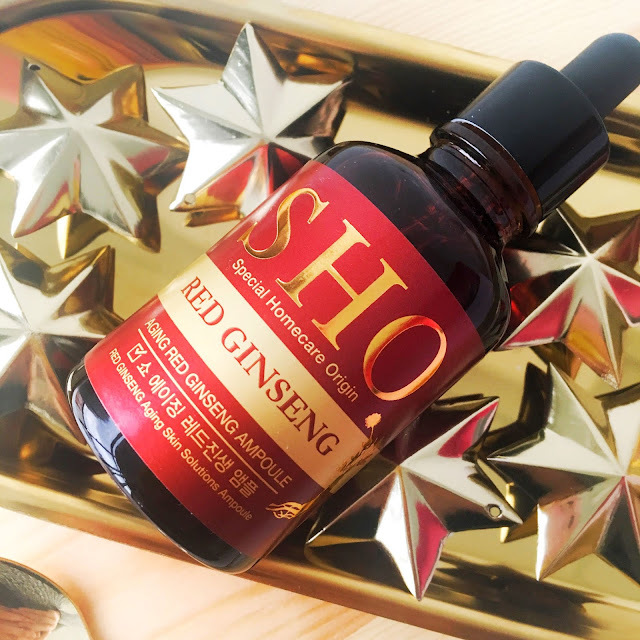 Being a highly cherished traditional ingredient that is said to help numerous health issue, red ginseng is also known for its benefits on the skin mainly on nourishing and revitalising the skin. 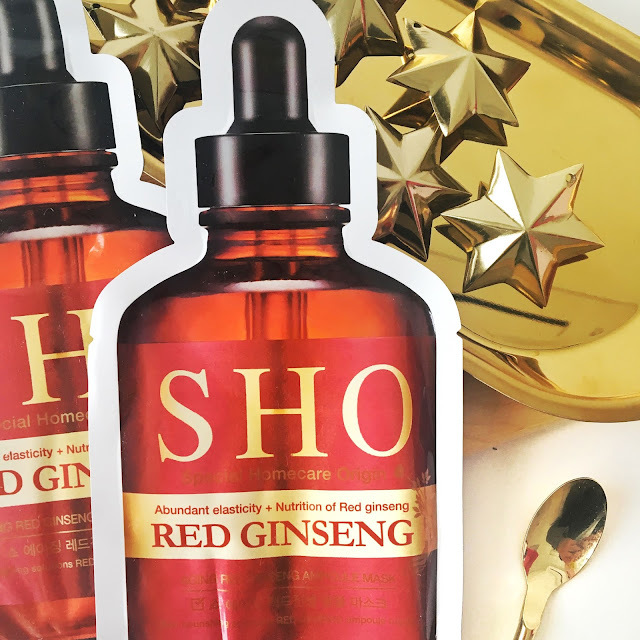 Before trying SHO's Aging Read Ginseng range, I would say that I had a fair share experience with other products containing the same ingredient. 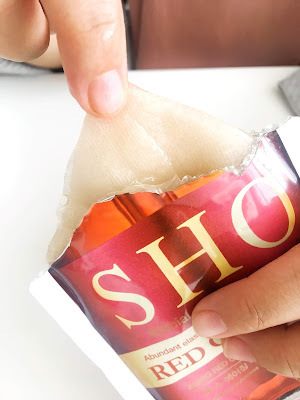 One major thing I can conclude with certainty is that I usually don't like how they smell, but seems like SHO's Red Ginseng Ampoule and Ampoule Mask have a more tolerable scent than the others. Camellia Oil: Improving skin glow, skin texture improvement. Like I mentioned earlier, I thought I was going to hate this serum because how thick it feels initially but thankfully I was wrong. 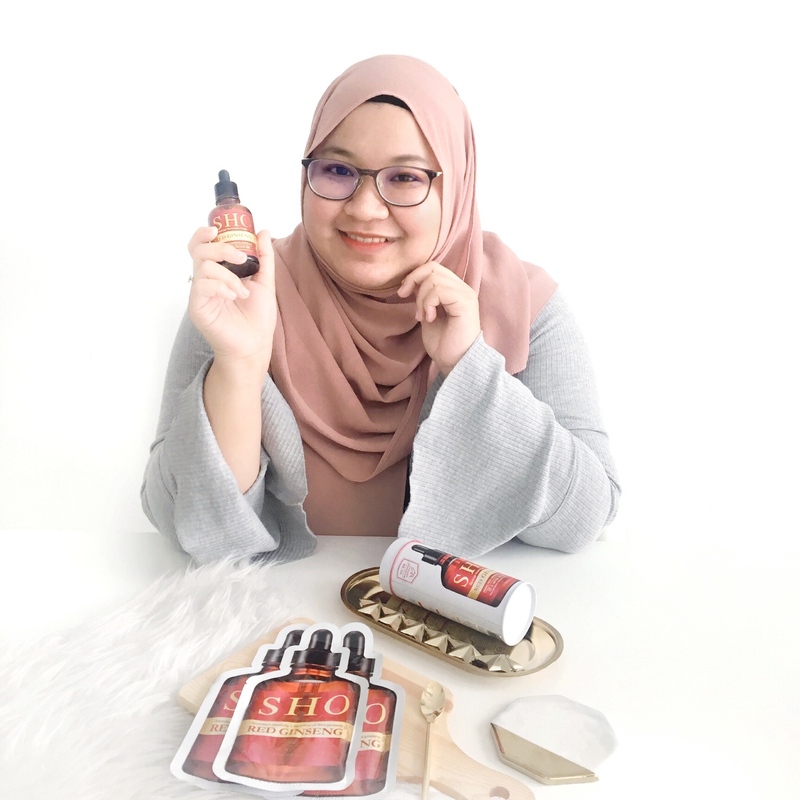 The product can feel slightly sticky during application but once I have spread and massage it out evenly on my face and let it dry, there is no stickiness left when I touch my face afterwards. Smell wise? Not the best but well, compared to some other ginseng skincare I've tried, this is tolerable. It has that traditional herb potion/concoction vibe that I don't like but it could be just me. 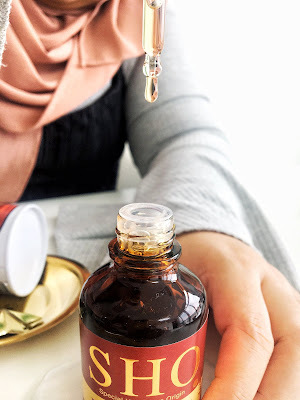 The ampoule is said to be three times stronger than a serum & according to the brand, you can just use it to replace the serum in your skincare routine. I like being extra so I kind of use both at the same time, applying the ampoule after my usual serum. So far, the hydrating effect can be said to be pretty immediate. I can feel my skin plump, bouncy and soft afterwards so I am totally loving it. My skin also feels firm and look glossy and healthy. 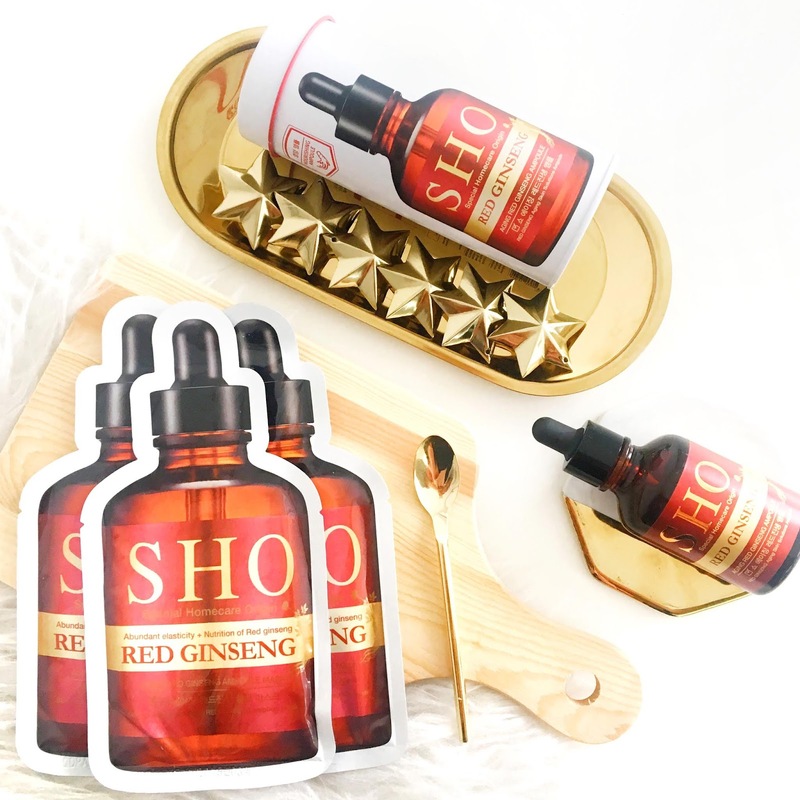 The anti-ageing effect is very hard to see immediately but the SHO Aging Red Ginseng Ampoule is definitely as nourishing to the skin as it claims. I would continue to use the whole bottle and see if more changes can be seen on my skin (especially that very fine lines on my forehead). Tips: You can use the ampoule to mix it with moisturiser and use it as a sleeping mask. You can try mixing it with your foundation too but I find it varies depending on the kind of foundation you use (some does not mix well). 9. Give skin a beautiful sheen. Additional ingredient to be highlighted include Portulaca Extract and Allantoin, they help to 'wrap' your skin, protecting it from external environmental factor which usually causes your skin to be tired and sensitive. The ampoule mask also helps balances oil level decreasing it by 60% and increasing moisture level by 46% after one application. So yeah, I love this mask a lot that I am thinking of repurchasing it again, but it is on a slightly expensive price tag. Each can (RM159) will contain seven sheet masks, making each mask to be priced at RM22.70 but according to SHO, this ampoule mask is meant to be used as a treatment mask instead of a daily mask so I guess it is pretty worth it considering how potent the formulation is. Texture: right side, ampoule mask. Left is the ampoule. Overall, the two products have been nothing but a delightful surprise to me. Despite the slightly higher price tag, I think it is definitely worth a try. Both the ampoule and ampoule mask are packed in a tube can and I like how quirky that is. SHO Aging Red Ginseng Ampoule and SHO Aging Red Ginseng Ampoule Mask can be purchased via SHO Malaysia Facebook or Instagram account. You can also visit the SASA store nearest you to get it.